The end of August in Iceland is when summer becomes fall. Before I started school again I wanted to catch the tail end of summer. So I went to the countryside to relax and enjoy. 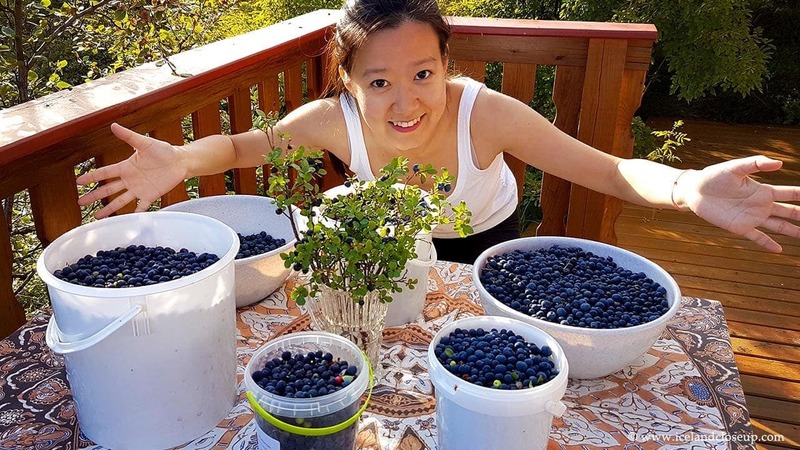 Staying there for a day didn’t only build up my tan and my body’s vitamin D supply (from the sun; the weather was really good), but I also managed to pick a lot of blueberries as a bonus. Yes, you read correctly! End of August is the high Wild Berry season in Iceland! In a lot of areas around Iceland you can find good spots to pick berries. Some areas are absolutely covered with them. 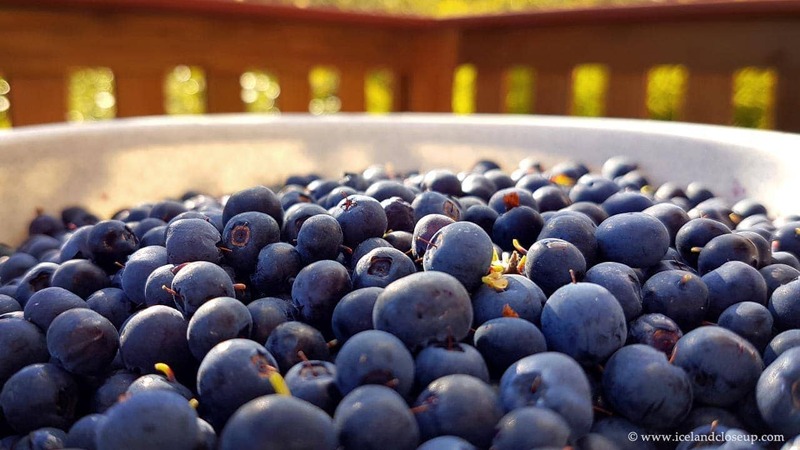 There are a few varieties you can find not only blueberries but also bilberries, crowberries and even stone bramble berries. The quality of those berries really depends on the weather each year. This summer the weather has been extremely good for the berries, sunny days mixed with rain. There are more good berries now than the last two years. I actually found crowberries in the beginning of August in the western part of Iceland, and they were already ripe and edible. Wild blueberries in Iceland look a bit different than the ones you might be able to buy in a store in your country. Fully grown they are dark blue on the outside and greenish on the inside. They are smaller and a little bit sour too, but don’t let that fool you, the taste is really good. And it’s also really fun to pick your own blueberries. Where can you go and pick berries? 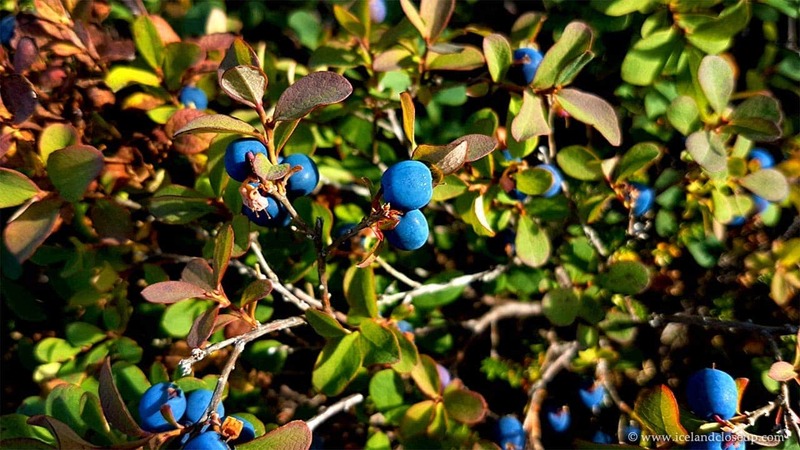 Picking wild berries in late August or early September is a tradition among Icelanders. It has been done since the first settlers came to Iceland. They were Vikings so if you are interested in what foods the Vikings ate, the Icelandic berries are a true Viking food. Full of vitamins and nutrition. 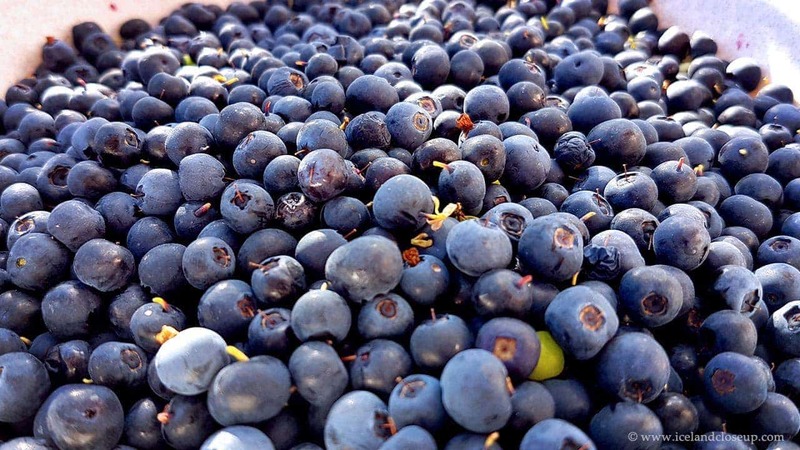 The health benefits of blueberries, for example, have been well known for a long time. When Icelanders go to pick berries they say, “að fara í berjamó” which directly means, “to go and pick wild berries.” “Ber” means berry and “mór” means turf or peat, meaning the area where the berries grow. 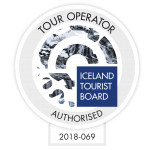 So where exactly is the best place to go to “berjamór” in Iceland? Well, it’s actually all around Iceland. Swampy areas and hills often turn completely blue or black depending on the type of berries. The berry plants flower during May and June and it depends a lot on the weather if the berries can develop fully or not. 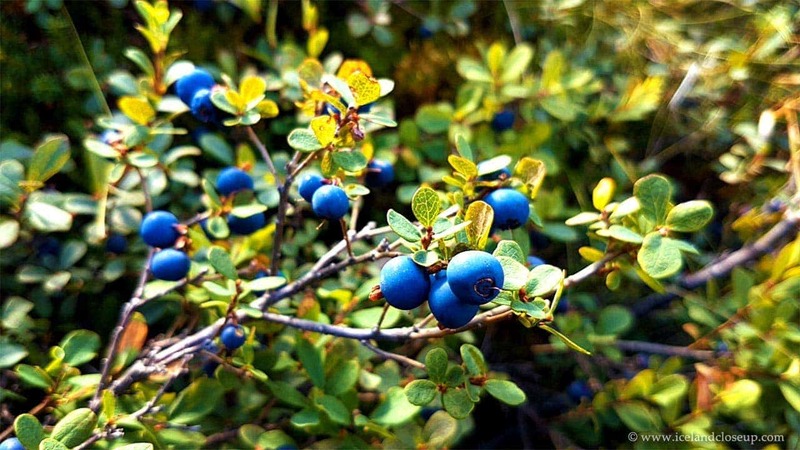 During my travels around Iceland I have seen many places with blueberries and crowberries. The types of berries might vary by area but you can really find berries all around Iceland. The berries need to be picked before the temperature goes below zero degrees (Celsius) at night. Because, when that happens, they are all ruined. So the best time to go to “berjamór” is after middle of August until… well… when there will be a frosty night. This year it might happen early or late… nobody knows. You should be good though until the beginning of September at least. It’s not about how much I pick, rather how well I enjoy my time. The place I went is located in the west of Iceland, called Borgarfjordur. There are so many blueberries this year. I was so lucky to come here on time; they were perfectly ripe. I had so much fun and picked lots of them. What do you need to prepare before going berry picking? If you think all those berries were picked with my fingers, then you’re wrong. My hands would probably be all purple afterwards if I did that. And it would take a much longer time. There is special equipment that is really good to have while picking berries. 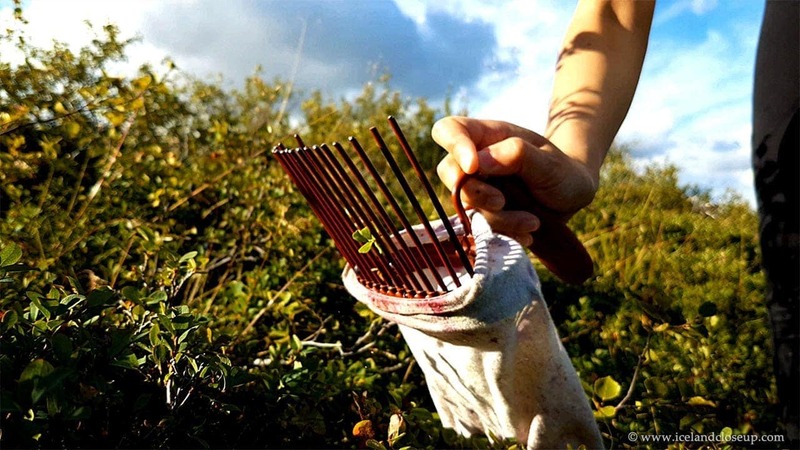 In Icelandic it’s called “berjatína.” Direct translation is “berry picker.” It looks like a small version of a rake or a comb with a little bag attached to it. It basically works like this: You comb through berry bushes, and as you go through, the berries fall of the plants and into the bag. This happens without causing damage to plants or pulling off too many leaves, very clever. Here is a picture of it. The bag can be easily removed. You can buy a berry picker in supermarkets. They are also available in plastic, like this one on Amazon.com. Second thing you will need is to prepare a pair of shoes that you don’t fancy so much. The reason is when you step on those berries (and you will step on a lot), the color from the berries rubs on your shoes easily. And sometimes even your pants. If you don’t have any spare shoes, you can use shoe covers or plastic bags and put them over your shoes. Be careful, though, because it can be slippery to walk like that. If you fall, you will also get color on your clothes! So be prepared and don’t worry, if you accidentally color your clothes or want to clean your shoes afterwards, adding a few drops of lemon on the berry spots before you wash them could help to get rid of the color. Wearing a hat can be helpful if there is a lot of sun, and remember to bring some big containers. One container is probably not enough; if you find a good spot you can fill a 4-liter bucket fairly fast. As you can see, the area I went to was full of blueberries, so it was a big harvest. Can you eat them right away? The answer is absolutely YES. They are 100% wild organic berries. Traditional Icelandic food and as pure as it gets. Both blueberries and crowberries you can put directly into your mouth. Just don’t eat the green ones (unripe) or some that have already spoiled (dark and wrinkly). What am I going to do with all these blueberries? The amount I got this time can last me a whole winter. As soon as I came home I cleaned them a little bit, taking away leaves and other debris, and put them in a freezer. If I wouldn’t freeze them, and just kept them in a fridge, for example, they would be ruined in a week. In the freezer they will last all winter and I can enjoy them whenever I want. They are very quick to defrost and can also be used to cool drinks or smoothies. There are so many ways to eat your berries. One traditional Icelandic way is to eat them with sugar and cream. Sprinkle white sugar on top and pour cream over. Delicious. You can of course use any sweetener you want. Some even prefer no sweetener, since the berries are already sweet. There are many ways to make a dessert out of them, for example. It’s also very popular to make a jam and use it as a spread on biscuit or bread. That’s a very good idea. Some also make a juice. I like to add them to my healthy smoothies for breakfast. It will add to the nutritional value and also make your smoothie even tastier. Using them as add-ons or flavouring in cakes, yoghurt, ice cream and sauces is also a great idea. If you have heard of Skyr, you can add it to that as well. Skyr is an Icelandic cultured dairy product which has been part of Icelandic cuisine for a thousand years. Skyr is very popular in Iceland and can also be found in a few other countries. Icelandic lamb that has been marinated with blueberries and served with blueberry sauce is so good, believe me. And I don’t think food can be any more organic than that. 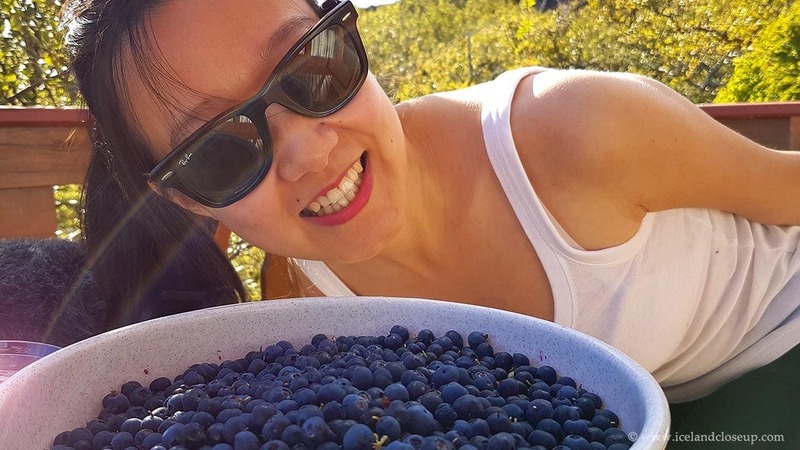 Using wild blueberries along with Icelandic lamb that has been eating grass out in the open nature the whole summer makes for a culinary treat. Have you picked wild berries in Iceland or somewhere else? Did you have fun? How did they taste? Share your story below.